Bella New Brighton, which opened on the New Brighton Marine Point on Wednesday 2 March, run 4 days of ‘dry runs’ – where customers got to try their own taste of Italy through the dishes of the brand’s menu – and all the money from the drinks and some items from the menu were donated to the local Claire House Children’s Hospice. Claire House Children’s Hospice offers care, support and choice to families whose children won’t live to be adults. 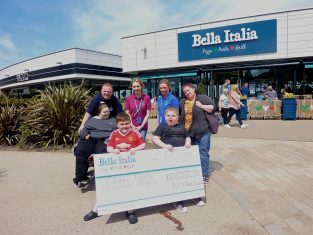 The cheque handover event saw three youngsters who are staying at Clare House, their families and Amanda Mitchell and Avril Parr enjoy a celebratory lunch. Bella in New Brighton has created 35 jobs and will be serving up authentic Italian treats for breakfast, lunch and dinner 7 days a week. Bella’s menu, which brings together the best flavours from across Italy, is packed with products from family-run Italian producers. Amanda Mitchell, the corporate fundraiser, said, “At Claire House, we focus on not what we do, but why we do it. Our nurses take over for a couple of days so mum and dad can be parents, as opposed to carers 24.7. Our physiotherapists help children who are confined to a wheelchair most of their day, feel the freedom and movement of water in our specially adapted hydrotherapy pool. The play therapists do so much more than just playtime; they help our families create memories that will last a life time. And our Family Support Team are on hand to offer emotional support to families when the very worst happens, for as long as they need it”.